Beautiful curtain on the window has become an indispensable attribute of the modern home. Good housewife boasts intricate drawings on canvas curtains, or bizarre shape of the product. 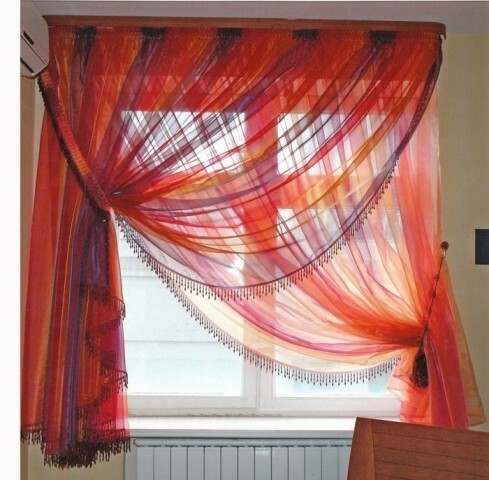 Many rely on the creation of curtains designers and professional dressmakers. But there are those, who knows, how to sew curtains with his hands - the Roman and the usual. How to do it yourself? Read more. Begin stitching is always a bit scary. Any seamstress will tell, that things, that seem simple at first glance,, many hidden problems. for example, if you decide to sew the curtains in the house with his hands, but are familiar with sewing recently, We need to learn a few rules. First of all, buying fabric curtains, add to the original width of the window opening three more of the same. This should be done in order, to curtains beautifully Draped, instead bristled pieces open windows. A little easier with a curtain, or evening curtain. then to the original standards need to add half. Then the material will cover the entire window and not be vulgar ridge. Secondly, with net curtains and curtain fabrics buy tape hooks, threads and fittings to match to the intended product. You can not play on the contrast of opposite colors, if your room is not painted in acid colors. Thirdly, choice of curtain fabric should be based on the overall style of the room. Is highly undesirable in the room, decorated in style hi-tech, hang curtains with ruffles and lambrequins. Fourth, all patterns and measurement should be done with a tool, roulette or tailoring centimeters. “The eye” is not the correct method of taking measurements. In the creation of simple curtains in the room is no big deal. Properly cut material prometyvaetsya and stitched on three sides, one sewn curtain tape. In the presence of assorted ribbons on the curtains, ring should sew the center curtains. 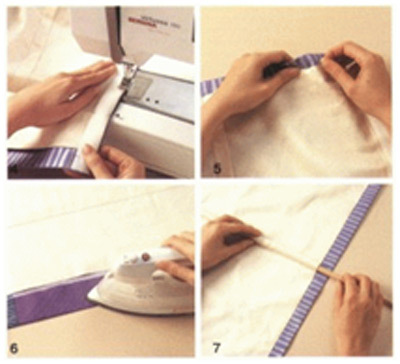 That's how you can sew curtains with his hands simply by observing the rules of sewing. Not the easiest option handmade art for a beginner - Roman blinds. Every year they are gaining popularity and are a great decoration for any living room or bedroom, so let them learn to sew. 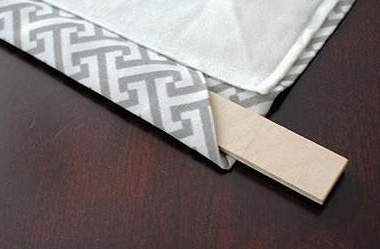 Sew roman shades you need to buy two types of tissue. it's desirable, the fabric was strong, how to drape, but there umelitsy, who sew roman shades of organza or other light fabrics. Another purchase metal or wooden rods, curtains along the length equal width, and to them a dozen plastic rings with a diameter 20 mm. stationery nails, Iron with the function of stripping, thread, scissors and adhesive tape for fabric. Attach a curtain must be on a wooden ledge, or directly to the wall or the window opening. – Measure the window width and plyusuem to her five inches on each side is the stock folds on the curtain. Accurately determine the length of the curtains, since this determines the number of folds and the distance between the joint-bars. – Rechecking a couple of times our measurements, go to cutting articles. In Roman blinds two webs: right and wrong. We start with the formation of the pattern of the back sheet, in other words, kroim lining. To do this, put off by the fabric length and width of the alleged curtains and make allowances for 25 cm on each side. We draw a straight line and cut the finished part of the lining. Getting its processing for further assembly curtains. From the lower edge of the retreating 25 cm and draws a horizontal line. Postpone the uplink from another 6 see - a place for kuliske. We draw the following line. Again postpone up 25 mass media 6 sm on Kulíškova, etc. Marked-lining overturn the wrong side, from all sides buckled longitudinal sections on the fabric. press out their. The next step will be chipped and pins primotyvanie lower line to the upper wings. And then executed by a machine baste stitches along a number. To stitch a seam has turned out strong and not a sprawling, at the end of the line, do the reverse line, selecting the appropriate reverse on a typewriter. We turn to the base web. It we measure with the expectation +5 see on longitudinal sections. To bend them and proutyuzhivaem. Connect both sides of the curtain, shearing of the product in the center. We carry a line around the edges, leaving pockets for space stva scenery. You can stitch stitching deaf, and then stabbed in the line of stationery to allocate space for kuliske, as you prefer. Now we treat the upper edge of blade. For this to buckle it on 5 cm, paving the adhesive cloth tape with eyelets and vystrachivaem countersunk string. Go back to the longitudinal seams, we ironed sized curtains. Perform line so, that it was on the lining fabric. At the bottom of the curtains from the lining do podvorot, to connect the webs, perform a line along the edge of the curtains. It's time to rods, that we put in scenes. The lower edge of the curtains, we insert a wooden rod, width 3 cm, to heavier product. 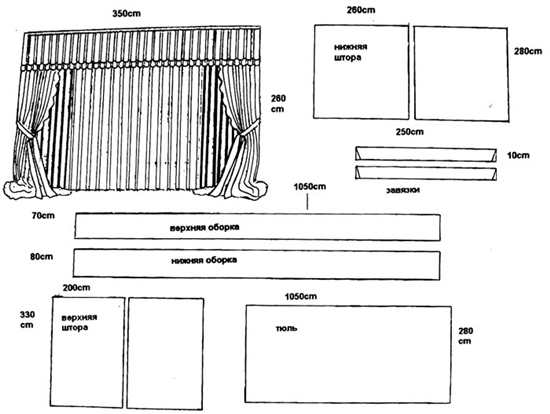 It remains only to sew the loops of three to each kuliske (or more, It depends on the width of the curtains) and thread the nylon cord, securing it at the beginning of the curtains at one end, and the other end of the lead to the build mechanism curtains. This shade will look great, worthy of decorating your window, And you can share with your friends way, how to sew their own hands roman blinds. Consider another kind of curtains, which you can make your own hands. Here, it will go easier, as a finished canvas to work a little easier. How to sew the curtains with his hands? Easy. To begin with patterns. Closely acquainted with patterns, presented on our site, you will find exactly what, that is suitable for your home. Remember, that in deciding whether, how to sew curtains with his hands, you need to keep in mind the size of the window opening, the length and width of the curtain fabric and texture of the fabric. No need to buy a transparent fabric for curtains, if you dream of beautiful swags and folds at the bottom of the curtains. 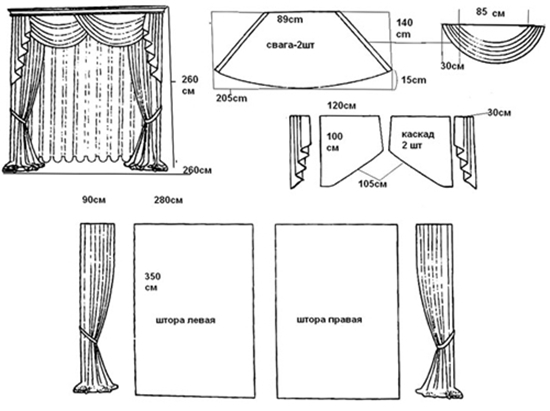 And vice versa, do not buy the heavy curtain fabrics, if you do not want massive structures on the window. Video course on making curtains with your own hands, you can look here and here. The kitchen suitable for both curtains to the floor window, and blinds. 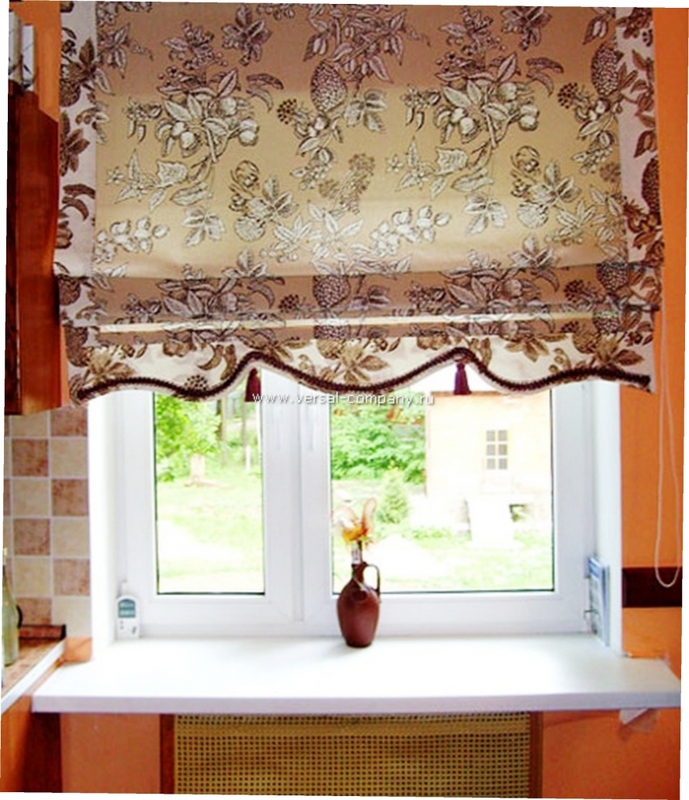 In recent years, Roman blinds are gaining its popularity in kitchens. How to sew curtains with his hands? We offer you a master class of, how to make Roman shades for the kitchen. Determine how much you need to buy fabric in the store. For this measure the width and length of the window opening, we add on all sides 5-10 see tuck. To leave the bottom of the canvas 10 see hem double seam. 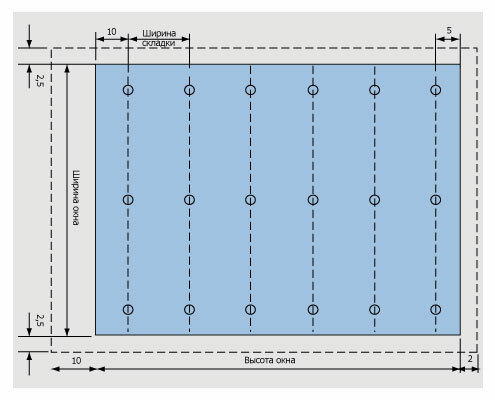 The precise width of the finished product is determined from the formula: cornice width multiplied by the coefficient of 1,5 to 2,5, (to the folds width) +16 cm for lining and facing fabric. Since this version of Roman blinds will drawstring, decide the number of them. Remember, that the minimum distance between the strings is not less than 7,5 cm. If narrow ties, then place them 13015 see each other. If the straps wide, to increase the distance between the width. for example, 18-20 cm. The width of the drawstrings selected depends on tissue density, you bought for curtains. If the fabric is light as a veil, the straps are sewn thin. thick straps are suitable for heavy fabric. Pattern drawstrings - it laborious, but fascinating. To finally decide on the width of the resulting product, take test pattern drawstrings, that tie around the eaves, and the look on their length. Getting the pattern of permanent laces for curtains, you make yourself, kroite two bands, adding to each width 1,5 see tuck and stitching. Along the length of add 2 cm. Immediately proceed to sew the ties. Fold them face each other and stitched by three sides, leaving nezashitoy short side. Gut-wrenching and ties are sewn from the front left, tucking inside the joints. After that, the ties should be well-ironed iron. Now sostrachivaem cloth future curtains for one side: lining + cloth. The lower edge of the fold on the inside 1 cm prometayte. After the fold edge of the folded in half and sew a hidden seam. Well its proutyuzhte. We decompose preform curtains, that sew their own hands on the table, paving the ties between the parties on the distance, you have chosen. Keep, to tie face to put to the front of the curtain, and the raw edges of fabric and strings are aligned. Pin all ties with two pins at each position. Stitched ties to the web. Putting the ready-made curtains. External seams collect and press out. We folded the bottom and press out well. All stitched by a seam edge "goat" or do it manually. watch carefully. All ties were of linen. The finished product is a well-ironed inside out. Curtains can be hung on the window. Now you can enjoy cross-linked by a curtain with his hands in the kitchen. Or you can also give a master class for friends on the subject of, how to sew curtains with his hands - the Roman and the usual.